Name of a family of Mayence. The name , which, according to D. Kaufmann ("Der Grabstein des R. Jacob ben Moses ha-Levi," in "Monatsschrift," xlii. 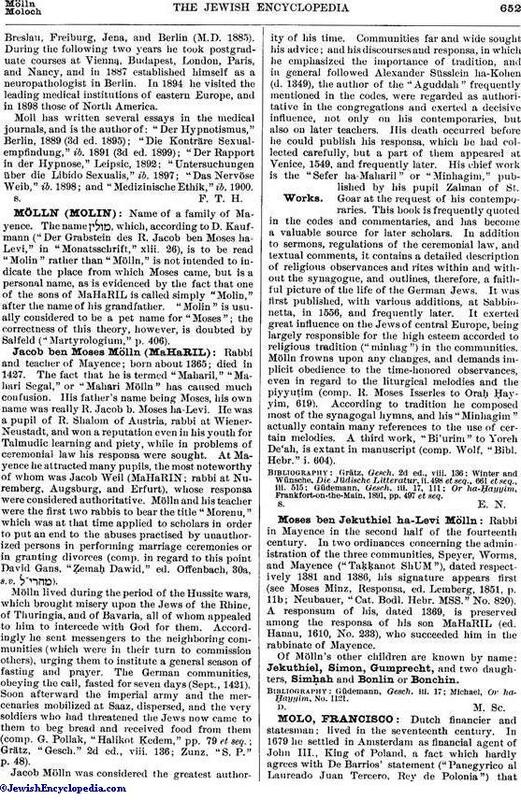 26), is to be read "Molin" rather than "Mölln," is not intended to indicate the place from which Moses came, but is a personal name, as is evidenced by the fact that one of the sons of MaHaRIL is called simply "Molin," after the name of his grandfather. "Molin" is usually considered to be a pet name for "Moses"; the correctness of this theory, however, is doubted by Salfeld ("Martyrologium," p. 406). Rabbi and teacher of Mayence; born about 1365; died in 1427. The fact that he is termed "Maharil," "Mahari Segal," or "Mahari Mölln" has caused much confusion. His father's name being Moses, his own name was really R. Jacob b. Moses ha-Levi. He was a pupil of R. Shalom of Austria, rabbi at Wiener-Neustadt, and won a reputation even in his youth for Talmudic learning and piety, while in problems of ceremonial law his responsa were sought. At Mayence he attracted many pupils, the most noteworthy of whom was Jacob Weil (MaHaRIN; rabbi at Nuremberg, Augsburg, and Erfurt), whose responsa were considered authoritative. Mölln and his teacher were the first two rabbis to bear the title "Morenu," which was at that time applied to scholars in order to put an end to the abuses practised by unauthorized persons in performing marriage ceremonies or in granting divorces (comp. in regard to this point David Gans, "Ẓemaḥ Dawid," ed. Offenbach, 30a, s.v. ). Mölln lived during the period of the Hussite wars, which brought misery upon the Jews of the Rhine, of Thuringia, and of Bavaria, all of whom appealed to him to intercede with God for them. Accordingly he sent messengers to the neighboring communities (which were in their turn to commission others), urging them to institute a general season of fasting and prayer. The German communities, obeying the call, fasted for seven days (Sept., 1421). Soon afterward the imperial army and the mercenaries mobilized at Saaz, dispersed, and the very soldiers who had threatened the Jews now came to them to beg bread and received food from them (comp. G. Pollak, "Halikot Ḳedem," pp. 79 et seq. ; Grätz, "Gesch." 2d ed., viii. 136; Zunz, "S. P." p. 48). Jacob Mölln was considered the greatest authority of his time. Communities far and wide sought his advice; and his discourses and responsa, in which he emphasized the importance of tradition, and in general followed Alexander Süsslein ha-Kohen (d. 1349), the author of the "Aguddah" frequently mentioned in the codes, were regarded as authoritative in the congregations and exerted a decisive influence, not only on his contemporaries, but also on later teachers. His death occurred before he could publish his responsa, which he had collected carefully, but a part of them appeared at Venice, 1549, and frequently later. His chief work is the "Sefer ha-Maharil" or "Minhagim," published by his pupil Zalman of St. Goar at the request of his contemporaries. This book is frequently quoted in the codes and commentaries, and has become a valuable source for later scholars. In addition to sermons, regulations of the ceremonial law, and textual comments, it contains a detailed description of religious observances and rites within and without the synagogue, and outlines, therefore, a faithful picture of the life of the German Jews. It was first published, with various additions, at Sabbionetta, in 1556, and frequently later. It exerted great influence on the Jews of central Europe, being largely responsible for the high esteem accorded to religious tradition ("minhag") in the communities. Mölln frowns upon any changes, and demands implicit obedience to the time-honored observances, even in regard to the liturgical melodies and the piyyuṭim (comp. R. Moses Isserles to Oraḥ Ḥayyim, 619). According to tradition he composed most of the synagogal hymns, and his "Minhagim" actually contain many references to the use of certain melodies. A third work, "Bi'urim" to Yoreh De'ah, is extant in manuscript (comp. Wolf, "Bibl. Hebr." i. 604). Or ha-Ḥayyim, Frankfort-on-the-Main, 1891, pp. 497 et seq. Rabbi in Mayence in the second half of the fourteenth century. In two ordinances concerning the administration of the three communities, Speyer, Worms, and Mayence ("Taḳḳanot ShUM"), dated respectively 1381 and 1386, his signature appears first (see Moses Minz, Responsa, ed. Lemberg, 1851, p. 11b; Neubauer, "Cat. Bodl. Hebr. MSS." No. 820). A responsum of his, dated 1369, is preserved among the responsa of his son MaHaRIL (ed. Hanau, 1610, No. 233), who succeeded him in the rabbinate of Mayence. Of Mölln's other children are known by name: Jekuthiel, Simon, Gumprecht, and two daughters, Simḥah and Bonlin or Bonchin. Michael, Or ha-Ḥayyim, No. 1121.